Most would-be restaurant owners don’t have a lot of start-up cash, and many end up renting their restaurant location. Renting a restaurant has several benefits. You don’t have to worry about a large mortgage payment (you do need to worry about rent, though) or taxes, or building maintenance. However, before signing any lease, whether long term or short term, do your homework. Find out if the landlord is someone you want to have a working relationship with. Find out why the space is vacant. Lastly, find out if the space will work for a restaurant. A former office or retail shop may not have the necessary requirements of a licensed eating establishment. If you are planning on making extensive renovations to a location first find out if the space will even pass inspection. Bring in the fire marshal, health inspector, and building code officer (code enforcement officer) to tell you exactly what needs to be done. After all the initial visits, you may find that renovations will be too expensive to justify that particular location. Lack of public bathrooms: ADHA bathrooms require a certain amount of stalls per seats and all must be ADHA compliant. If all you have is a one-seater, is there enough room to add more bathrooms? 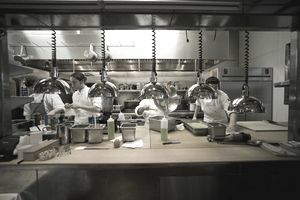 Lack of outside ventilation: Restaurant kitchens produce a lot of smoke, grease, and odors. Therefore, ventilation is necessary, not only to keep the dining room free of smoke but to keep the kitchen a healthy work environment. Finding outdoor ventilation can be a problem in older downtown buildings. No Garbage pickup: Restaurants produce a lot of garbage. Is there a place for a dumpster nearby? Or can you share with other local businesses? If your location passes the first phase of inspections, discuss with your landlord which repairs he is willing to cover. Again, if the space is in a hot-to-trot neighborhood, you may find yourself paying for nearly everything. However, if the space has been vacant, you can gently remind the landlord that you should not have to pay for renovations and repairs that you can’t take with you at the end of the lease. For example, if you have to update plumbing or heating ducts, they are going to stay with the building. If a landlord refuses, then it may be a sign to look elsewhere for a restaurant location. Ask other tenants in the building about their experience, both with the building location and the landlord. Ask if the landlord is easy to work with and if he addresses problems quickly. You can also ask about the pros and cons of the location, as well as their thoughts on a new restaurant going into the building. Of course, take everything other tenants say with a grain of salt. If they think a restaurant is a fantastic idea, remember, it’s their opinion, not an actual fact. Depending on the location of the restaurant space you want to rent, you may have quite a bit of room for negotiating your lease as well as your monthly rent payment. If the location is a busy downtown sector that full of thriving businesses, you may not have any wiggle room with a lease. If a spot has been vacant for several months you can probably haggle with the monthly rent or get the first couple of months (your start-up phase) free. Remember, the landlord wants businesses in the building. That is the only way he can generate income from his building. Having a business in the building will attract other businesses and increase the value of his property. So it is to his benefit to get you into that building. Pro-rating rent. You may pay a very low rent the first year of the lease, then gradually increase it each year thereafter. Including building repairs in the rent. If you make significant repairs to the plumbing or heating, then ask if they can be deducted from your regular rent. Most landlords would rather give free or reduced rent one month than shell out cash to make repairs. Once you and your landlord have come to an agreement on what he will cover, make sure to have (in writing) a plan that allows for unexpected repairs. For example, you are half way through installing the commercial hood and ventilation in the kitchen when your contractor informs you that new ductwork has to be put in place. You should have an agreement that your landlord will cover this unforeseen expense. Don’t lock yourself into a long lease, at least not the first year you are in business. If your restaurant fails (hard to think about, but a necessity to consider) you don’t want to be locked into four more years of rent that you cannot pay. A lease is a legal binding document and the landlord is within his rights to sue you for the rest of the rent, or at least the rent that is owed until new tenants take up occupancy, if you default. If the space you want to rent is only available with a long-term lease (more than a year or two) think long and hard about whether or not it is really worth the risk. A pro-business landlord should be willing to start with a year lease and work from there. If the landlord refuses to negotiate, they probably won’t be any easier to work within the future and more trouble than the space is worth. Leasing space for a new restaurant offers business owners many benefits, including lower start-up costs than a mortgage and building overhead. However, just because you don't own the space outright doesn't mean you should agree to any and all terms of a lease. Remember, when renting a restaurant space the lease is a legal and binding document. Careful consideration should be given to the cost of rent, the length of the lease and the fine print of who pays for what.